I just had to show you this beautiful hand-made brooch I ordered for myself from Mandy at http://www.a-la-parisienne.blogspot.com/. Mandy's beautiful blog is on my blogroll and is a must-see treat. She is a beautiful young mother who has several creative endeavors going, including photography and blog design. I purchased this beauty from her Etsy shop. How satisfying it is to own something so unique and lovely. 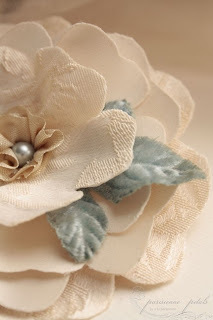 Her brooches always are designed with such feminine details and colors. Mine is adorned with this pretty vintage blue pearl. When I opened the box, it was wrapped in fancy tissue paper and tied with an ecru ribbon. Mandy even included a hand-written thank you note and care instructions. Such attention to detail! Be sure and visit her. Now....I have to shop for an outfit pretty enough to wear it with! Fabulous piece Carol. I have to check her blog and perhaps pick one up for moi! You definitely should. I love mine. 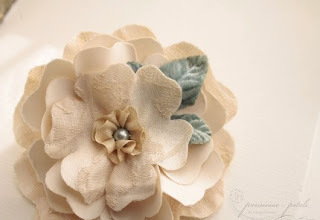 You are so sweet for taking the time to share the brooch I made with your friends. I am so honored that you have me on your blogroll as well! I am so pleased that you love your brooch. Thank you so much. You are so welcome, Mandy! Fantastic find. My mother wears one my father bought her in the Lanvin or Chanel or some similar boutique in Paris, early 70's. Still garners admiring comments to this day. Might have to pick one up for Mrs. E. for Valentine's Day. Thanks for the idea! Easy and Elegant Life-Thanks for coming over. I think it would be a nice V-Day gift for sure.